The first film by Benh Zeitlin is the enjoyable story of underdogs, living on the fringes, who kick against natural – even primeval – and institutional pricks, to be left alone to live the life they want to live. Six-year old Hushpuppy lives next door to her father in a ramshackle treehouse/shack in the Bathtub, a precarious island deep in the bayou. 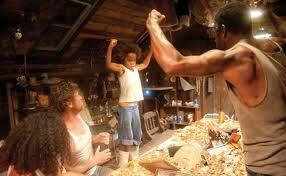 Her father drinks as part of his battle with mental and physical illness but, despite a devastating storm, he continues to do his best to bring Hushpuppy up the right way, their way. It’s a very watchable film, let down slightly at times by self-consciousness and a Disney-like feel. It’s an original child’s-eye perspective on the effects of Hurricane Katrina, the opening sequence is gloriously anarchic and there is real imagination and humour – Hushpuppy lighting her stove and when she reminisces about her mother’s beauty is a hilarious moment. Hushpuppy, played by Quvenshane Wallis – chosen from 4,000 hopefuls, bursts with innocent rebellion and resourceful loyalty and we genuinely sympathise with the father, played by a non-professional actor. But, after a cartoonish mission to unplug the floodwaters, some forced ideas (is a brothel the place all the outsider children feel whole and comforted?) and a slightly sentimental predictability, while we enjoy it, we are left without quite feeling the magic. 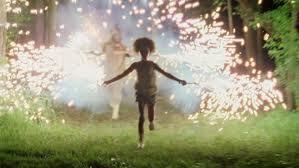 This entry was posted in Reviews in English, USA and tagged American Cinema, Beasts Of The Southern Wild, Benh Zeitlin, Dwight Henry, New American Cinema, New US Cinema, Quvenzhane Wallis, US Cinema on January 9, 2013 by pabetterthandisneyland. The chirpy but corporate manageress of a fast-food outlet receives a phone call, apparently from the police, informing her that a young, female employee has been under surveillance and has been reported stealing money from a customer. Not even a screen-filling disclaimer in the first few seconds that the film is based on real-life events excuses the misguided, voyeuristic, exploitative, mean-spirited, people-loathing horror that follows as the “investigation” proceeds. To get under the psychological skin of obedience to authority in the face of questionable acts might have made for interesting cinema and the story itself would raise an eyebrow, as The Imposter did. But what we see here is a version of Hostel: the protracted humiliation of a young woman dramatised linearly, literally and very deliberately. And the heavy-handedness doesn’t stop with the serial strip-searching of the girl under suspicion: characters are either good or bad (mostly bad) and, of course, corporate America is shallow and ridiculous – “You’re fucked without bacon, I can tell you that”. A film about ugliness and moral weakness, made in a way that is ugly and both intellectually and morally weak. This entry was posted in Reviews in English, USA and tagged Ann Dowd, Compliance, Compliance movie, Craig Zobel, Dreama Walker, New US Cinema, US Movies on January 7, 2013 by pabetterthandisneyland.